Designed for runners by runners, the Nathan Power Wash 64oz Detergent is the perfect way to remove stains and keep your clothes smelling fresh. This organic detergent is vegetable-based and biodegradable, so it isn’t harmful to the environment. It’s also dye and fragrance-free, which is a great perk for those with sensitive skin. 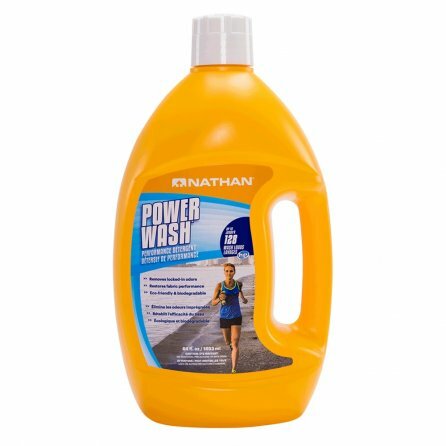 The all-natural ingredients are tough on stains but not on your performance running clothes, and with a neutral pH it won’t damage fabrics or discolor your clothes. The newly designed cap and spout also makes pouring a breeze.